So I got around to playing Uri's first game, Insanity, and I've decided not to translate it. Here is my reasoning: The Crooked Man was a game. Paranoiac was a poorly-designed game. Insanity struggles to make it to "game" - it's a flimsy container for a story, and a strangely-paced one at that. Very little of interest happens for nearly half the game while you go around finding keys (though at least they're labeled and you have a map with room names), and then you finally encounter all the plot. Oh, and there's very little, uh... horror. It's just silence most of the time, and only in the latter part is there ANY kind of suspense beyond knowing you're locked in a house and there's a corpse. However, like Paranoiac, the plot is at least worth a mention. So I'm making a compromise: I'll summarize it, hopefully providing a better experience than you'd get boring yourself with the actual game. A bunch of high school kids go to this mansion which is supposedly haunted or whatnot to take pictures, but they can't go inside, so whatever. Later, they decide to return and explore. They soon find a corpse in the dining room, and the front door is locked behind them because it always is. The six split up into groups of two to find another exit, the playable group being Keisuke and Kyouko. Kyouko, who's like Sissi with a big hat, plays a piano and finds a key in the strings, an idea which Uri never reused ever. Loud moron Ryouji is attacked by a mysterious assailant and knocked out. Kyouko and ditzy Riho stay with unconscious Ryouji. The corpse found earlier (which Keisuke noticed seemed fresh) goes missing. Kyouko feels guilty because she thinks it's her fault Ryouji came to the mansion, and runs off vowing to find his assailant. Riho goes after her, and when Keisuke enters, Ryouji is also gone from the room. 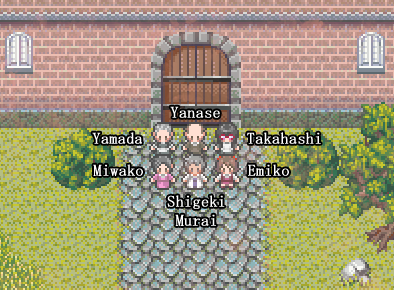 While exploring, there are some very minor bits of info on the master's wife (Miwako), the mistress (Emiko), the servants (Yanase, Yamada, and Takahashi), and the master himself (Shigeki Murai). Keisuke eventually finds a secret door to the basement in the fireplace in the master's room. There, he finds Ryouji locked up in a cell - still unconscious, meaning someone brought him there. Keisuke reads a diary written by Murai. He continued his grandfather's research on a certain medicine to get his mind off his daughter's death, but soon starts taking it very seriously. He brings a run-over dog corpse to the basement and says that after giving it the medicine, he swears he saw its feet move. He brings more and more dead animals to test on. "Takahashi did something bad. But with her kindness, I'm sure she'll forgive me. I must hurry in my research." "I thought that at least Miwako would support me. So sad. So painful. So lonely." "Forgive me, Yanase. It will all be worth it soon. Very soon." Keisuke finds most-unremarkable-character Yuuki trapped in a locker and gets him out with a crowbar. He knew things about the mansion from his grandma Yamada and came into the basement looking for an exit. However, he was chased by a guy with a knife and hid in the locker, but couldn't open it. Then said guy with knife appears, so they both hide in the locker... and get stuck. Meanwhile, glasses boy Kenta finds parts of the butler's diary suddenly lying around on the floor of the mansion for no apparent reason. The butler talks about a funeral for the mistress, and how they shouldn't blame "the driver," as he's dead as well. Later, he notices his master seeming happier, going about his "research." He asks about it and the master just says he'll be able to meet Emiko again. Wanting more details, he learns that his master is attempting to bring corpses back to life. His master kills Takahashi and says he'll be able to bring her back as well. The butler warns Yamada to leave, and she does. The master kills his wife when she finds out about Takahashi. Due to the terrible smell, people start saying the mansion is haunted, which the butler notes isn't entirely incorrect given all the dead animals and people. His master says that someone took pictures of the mansion, which must mean they're after his research, so he should kill anyone who comes along. The butler decides he's going to resign. Kenta runs into the guy with the knife and hides in the fireplace, then noticing the door to the basement. He finds Ryouji, but is attacked. He survives if he puts a thick book in his chest beforehand. Yep. "Um... excuse me? Did you wander in here? There's a strange person around here, and it's dangerous, so you should leave..." *he turns around* "I-Is that a knife?! U-Um, uh, are you... ...the strange person?" Kyouko runs from the killer, but can't run anymore, and her big silly hat falls off. He suddenly stops and believes she's his daughter Emiko, successfully revived. Kyouko is a big stupid and tries to tell him she's not Emiko, but he passes it off as a side-effect of just being brought back from death. Murai takes her down to the underground lab and talks about his research into the reviving medicine, and how he was motivated by the thought of seeing her again. Kyouko is shown a room of his "test subjects," which are a bunch of skeletons, the corpse they found earlier, and a still-alive Riho. Murai says he'll be able to bring them back, especially now that "Emiko" has "proven" it works, and thus he won't have done any crime. She calls him crazy and again insists she's not Emiko. This time he gets it and chases her, asking what she did with Emiko and demanding his family back. Kyouko runs to the locker guys who bust out just in time and whack Murai with the crowbar. They get the jail key from Murai and go free Ryouji. Kenta also rejoins and they untie Riho, making a big long conga line of six. As the party goes to check the last room, the game decides to dump a really long flashback to every pre-game event, even the ones that were rather well-described already. It begins with Murai and Emiko getting along, but Murai feeling like she's growing apart from him, including wondering whether she has a boyfriend or whatever. Emiko then dies, being hit by a car. Murai finds his grandfather's books researching the reviving medicine and decides to entertain it just to get his mind off Emiko's death. Murai drags animal corpses to the basement to test and the servants start to complain about the blood on the carpets. Murai says they'll gladly clean it up once they see his results. Takahashi's curiosity soon gets the better of her and she goes into the basement. She finds Emiko's ashes and realizes Murai stole them. She calls Murai out and he kills her. The butler Yanase sees things are getting bad and warns Yamada (Yuuki's grandma) to leave, not even telling her the real reason for Takahashi "quitting." Murai's wife Miwako becomes similarly curious and finds not only Emiko's ashes, but Takahashi's corpse. She is also killed after yelling at Murai that he's crazy and can't bring them back. Yanase wants to stay loyal to his master, but can't take it anymore after being told to kill any intruders, and is killed before the kids arrive. Finally, the kids actually enter the room and find Murai with Emiko's ashes and the medicine. He refuses to hand them over, and Keisuke says he's going to call the police on him. Kyouko (calling him "father," because, uh) speaks up and convinces Murai that his family would be happier to rest in peace, at least until he can complete his research. They look around for an exit but never find one, so they die in the basement surrounded by reeking corpses. Hooray! If Keisuke returns to the room instead, he's able to stop Murai in time. Murai leads them out and turns himself in to the police. Murai dies several days later regardless because of serious malnutrition. The media apparently gets none of the details on the incident out of them. On the roof of the school, Keisuke and Kyouko talk about how Murai seemed so nice when he mistook Kyouko for Emiko, and how he would have been a loving dad had Emiko not died. And if you played Misao, well... it does the exact same scroll-up fade-to-white on the exact same rooftop. GOOD END: KNOCKIN' ON HEAVEN'S DOOR. Depending on your choices (Kenta can get stabbed or not, Kyouko can save Riho or not, and Murai can kill himself or not), there are technically five bad endings, but I'm pretty sure they're mostly identical. Oh, and one last thing: the "titles" given for the characters on the menu screen are very silly.